It’s been awhile since you’ve heard recipe news from me. As you know, I’ve been cooking and supervising hundreds of volunteers to continue feeding those-in-need from the aftermath of Hurricane Sandy. It is definitely a time to give thanks: For me personally, the thanks come from the opportunity to serve. The food maven himself, Arthur Schwartz, came to help yesterday and will be there in our satellite kitchen at Congregation Beth Elohim today. His tasks included peeling eggs (20 dozen of them!) and sautéing 30 pounds of onions until caramelized. They are for the homemade bread stuffing we will make for our pre-Thanksgiving meals. Our goal is 1500 sandwiches and 250 hot lunches – roast chicken, stuffing, mixed vegetables, cranberry sauce and “dinner” rolls. Fresh apple slices, too. Anne Hathaway and her new husband came to visit us at the shul the other day – they were heartened by the work that was taking place. That said, here are some of my favorite Thanksgiving recipes, for it is a time when simplicity might be most appreciated. I, too, will be preparing a Thanksgiving meal for a dozen or so of our family and friends, and then again on Saturday. And a nice invitation just came our way – a dinner of leftovers on Friday night at a neighbor’s home. I adore leftovers more than you can imagine. In addition to the radically simple recipes below, you might enjoy my refreshing cranberry granita – yes, made from a wobbly block of leftover cranberry sauce – complete with its ridges. This really elegant recipe is a cinch to make and looks like an elaborate French “ballontine.” Have the butcher bone the breast, leaving the breast halves attached and the skin on. This is a perfect Thanksgiving recipe for six, but often I roast turkey thighs that are marinated in garlic, fresh thyme, rosemary and white wine so that we can all enjoy some dark meat, too. Stunning and simple. This is one of my favorite inventions! After (or before) Thanksgiving you can transform a can, or two, of jellied cranberry sauce into an amazing granita — or sorbet. Garnish with fresh raspberries or pomegranate seeds. If you don’t have an ice cream maker to make sorbet, you can prepare this as a granita by freezing the mixture and stirring it with a fork until slushy. 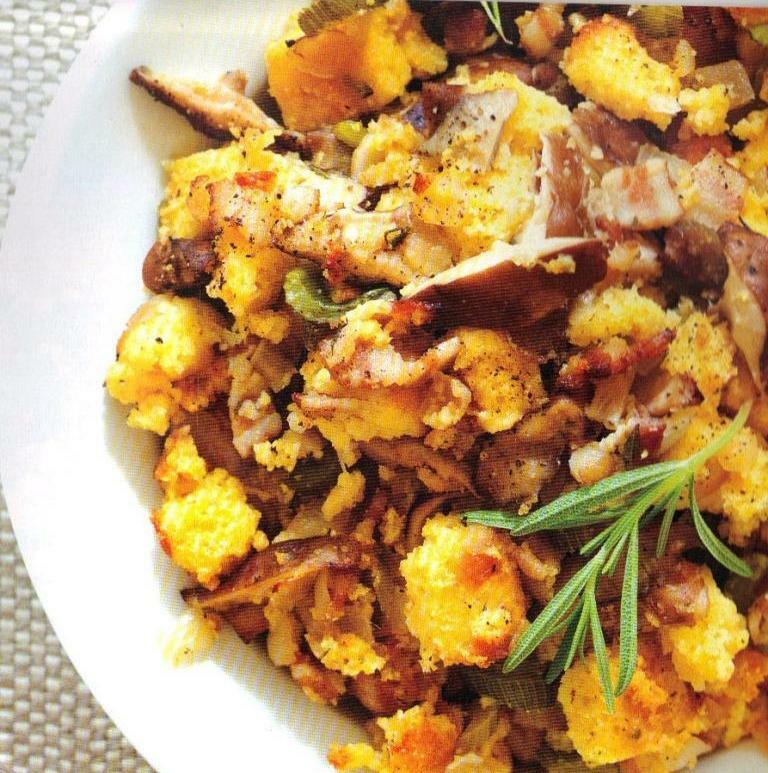 Cornbread, Bacon & Shiitake Stuffing. Photographer: Terry Brennan. 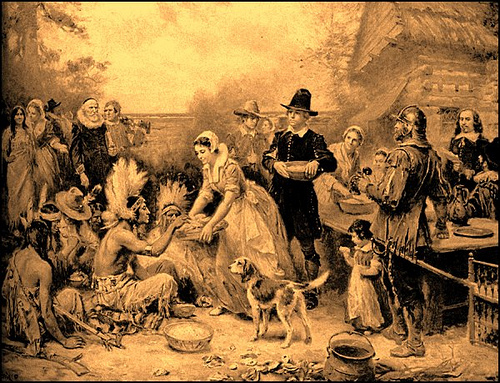 Thanksgiving stuffing, also known as “dressing” (which always perplexed me), is one of my favorite parts of the meal. I grew up with Pepperidge Farm packaged “croutons” mixed with lots of butter and caramelized onions and I loved it when my mother baked it in a casserole and the topping got all brown and crispy. It is one of those childhood taste memories which I cling to, still. But I offer you a slightly more upscale, and definitely more interesting stuffing this year: Cornbread, Bacon & Shiitake Stuffing. 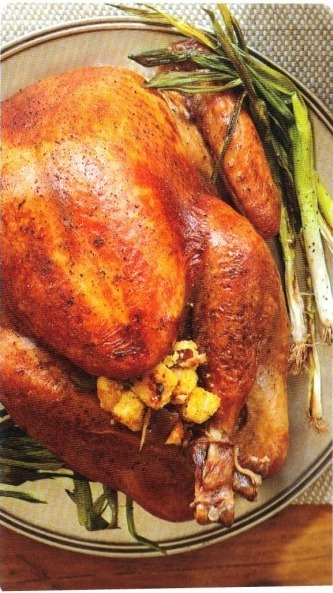 It is meant to accompany almost any turkey flavor profile or cooking technique, but has real character of its own. It might seem labor intensive to make your own cornbread, but this recipe is speedy and can be done way ahead of time and frozen, if you wish. I hardly ever freeze anything but please feel free — especially if it’s going to keep the stress level down. In that spirit, I would like to offer the concept of Mindful-Based Stress Reduction and specifically apply it your Thanksgiving preparations. You should make the cornbread at least 1 to 2 days before using as it’s best if it’s a bit dry to better absorb all the delicious juices. You can use an equal amount (16 ounces) of store-bought cornbread or corn muffins, but the result will be sweeter. The stuffing itself can be made a day ahead and reheated. To make the cornbread: Preheat oven to 400 degrees. Put flour, cornmeal, sugar, salt and baking powder in a large bowl. Stir in milk, egg, and butter. Stir well and pour into well-oiled 8-inch square pan. Bake 20 to 25 minutes until just firm. Let cool. Today the stuffing, tomorrow the sweet potatoes: Three fab recipes! Stay tuned. Over the years I have created dozens and dozens of Thanksgiving recipes for Bon Appetit, cover stories for Real Food, and once concocted a 15-ingredient Thanksgiving dinner feature for Newsday. Yes, 15 ingredients for the entire meal! One day I’ll share that with you. 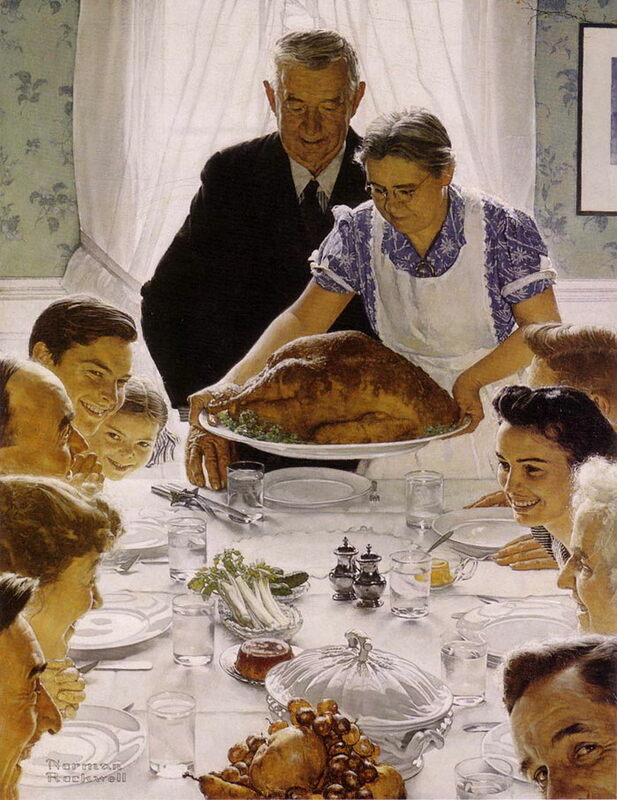 But today I begin a seven-day countdown to America’s finest holiday, the one we will all be sharing next week. What a lovely notion. And while today, the 3rd Thursday of November is known around the world as Beaujolais Nouveau day, and next Thursday is Thanksgiving day, it’s not a bad idea, at all, to serve the former with the latter. Wash turkey; remove giblets. In a very large pot, combine 2 cups apple cider, salt and water. Add 2 cloves garlic, pushed through a press. Stir until salt is dissolved. Submerge the turkey, breast side down, in brine. Add water to cover the turkey, if necessary. Cover and refrigerate 16 to 24 hours. Remove from brine and pat very dry. Place turkey on a rack on a platter (to catch drippings) and refrigerate, uncovered, for 24 hours. Preheat the oven to 325 degrees. Trim scallions and place side by side on a large, shallow roasting pan. Place turkey on scallions. Roast 2-3/4 hours until done, tipping turkey into pan twice while roasting to remove juices. Meanwhile, put 1-1/2 cups apple cider, chicken broth, remaining garlic clove, pushed through a press, and butter in a large saucepan. Bring to a boil; lower heat and simmer 20 to 30 minutes until reduced to 1 cup. Dissolve cornstarch in 3 tablespoons water and whisk into saucepan. Simmer 5 minutes, whisking constantly, until smooth. Add 1 tablespoon finely chopped tarragon and set aside. Today the turkey, tomorrow the stuffing. 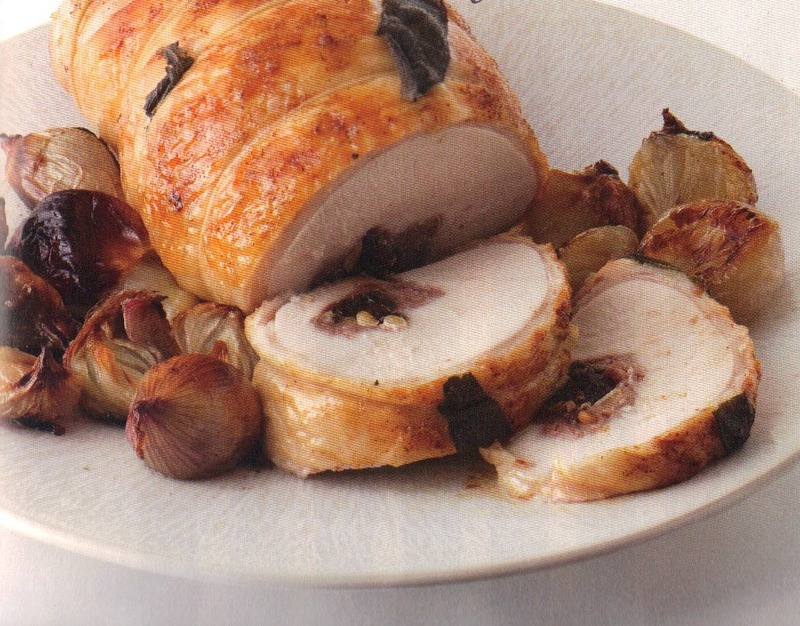 This is radical: A deconstructed holiday bird featuring white and dark meat that roasts in just 1-1/4 hours! The flesh stays ultra-moist and flavorful because of its overnight immersion in wine and brine. Smaller, flatter pieces allow faster browning and less cooking time. It is perfumed with bay leaves, fresh or dried, and a bit of aromatic oregano which imparts a revelatory herb-y aroma, the sine qua non of Thanksgiving smells. This is the perfect bird for those who: have only one oven; have no more than eight friends; who love to try new techniques; and for those who like to break with tradition. It is also a recipe for those who like to give themselves a break! There is little fussing or guess work in determining how the white meat will stay juicy and the dark meat thoroughly cooked. You begin with a total of 8 pounds of raw turkey (breasts and thighs only) which will amply fill your large turkey platter. Another bonus? There is little last-minute carving to do. So begin the process today. Select your turkey parts at the butcher or grocery. Before you go to bed, submerge the turkey in a very large pot (make sure it fits in your fridge) filled with wine-and-brine (see below). Cover and refrigerate overnight. This new technique will ensure a good night’s sleep and liberate both you, and your oven, on the big day. You might want to serve this year’s turkey with Marilyn Monroe’s recently-revealed stuffing recipe, my spiced cranberry chutney, Joan Hamburg’s amazing Ritz Cracker Stuffing (see The Food Maven’s website), or the world’s simplest sweet potato puree accented with orange and fresh ginger (sssshhhh….it’s fat free). And…if you’re interested in trying something new, have the following ingredients in your kitchen tomorrow morning: 4 pounds sweet potatoes, large container sour cream, large chunk of extra-sharp white cheddar, curry powder, ground cumin, cinnamon and ginger and stay tuned!